Your dashboard is the main display you see when you log in to Jira. You can create multiple dashboards from different projects, or multiple dashboards for one massive overview of all the work you’re involved with. I have created a system dashboard that should be helpful to most. 1 – HIGH PRIORITY issues from all projects you are involved in. 2 – MID to LOW PRIORITY issues from all projects you are involved in. 3 – Standard Welcome to Jira with a few links for tutorials. 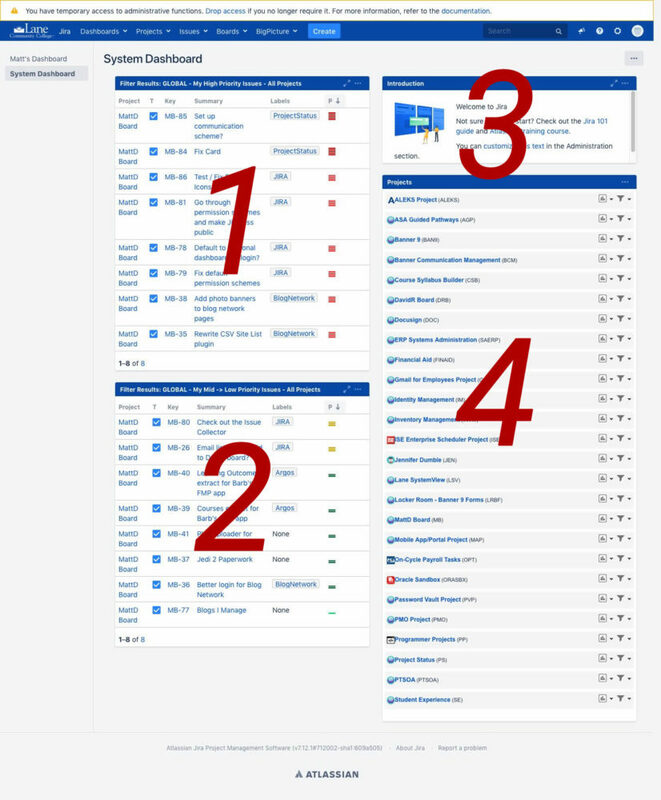 4 – List of ALL projects in Jira that are visible to logged in users. If you would like to further customize dashboards, just let us know and we’ll be happy to help.